Three and a half years ago, I left my home state in the firm belief that I would not move back again. Heading west, I knew I would return to New Mexico for visits, but that was it. Now I am back in the Land of Enchantment for the foreseeable future. 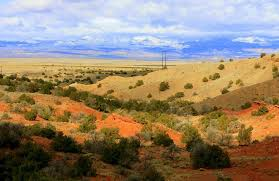 The time I spent in New Mexico while living elsewhere was richer. I became more aware of the differing cultures and my own roots. Even the desert landscape seemed more vibrant. I moved away for the sake of following opportunity, and I have no regrets for doing so. I feel everything happens for a reason and I leave it to God to direct me to rewarding successes and mistakes to learn from. I returned for family at a time when my family faces new challenges and my last opportunity came to an end. The decision to move back was not easy emotionally, but it was an easy one to make. Fiancé and I knew it was time to start over, to be with family and carve out a new path. Time to step back, take stock of what is really important, and start again from a firm foundation. It is also a time to look forward years down the road and think of what we would regret more – moving closer to family or staying away? Staying apart from family still kept our thoughts with them. We couldn’t help but think that we should be helping, doing something, if only by being closer. Sleep was difficult and the feeling of being orphaned was prevalent in each day. There is a lot to do and figure out. A lot of work ahead of us. We are not home quite yet, at least geographically. What I have developed is a sense of home apart from a place, but in a person. Fiancé is my home, no matter where I am. We’ll move forward together…no matter where we move. 🙂 Home is not a place, but a person. That’s lovely. Can’t wait to hear about the next chapter.